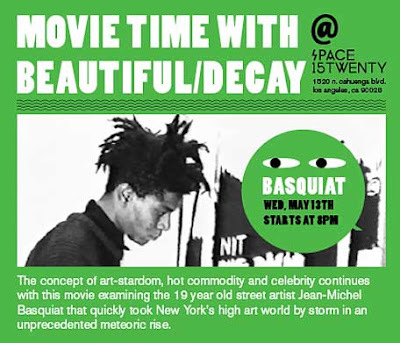 Our friends at Beautiful/Decay are screening art-based films all month long at the new Space 15Twenty, in Los Angeles . This week’s installment is artist/director Julian Schnabel’s 1996 film Basquiat, about graffiti artist turned neo-expressionist painter Jean-Michel Basquiat. Basquiat rose to prominence in the early 80s, and the film explores his celebrity and star status in the otherwise pretentious New York art scene. The movie introduced us to the talents of Jeffrey Wright and also stars David Bowie, Benicio Del Toro, Dennis Hopper and Courtney Love. The film is being shown on a large outdoor screen behind the gallery. Seating is limited so get there on time. Check out the trailer below.